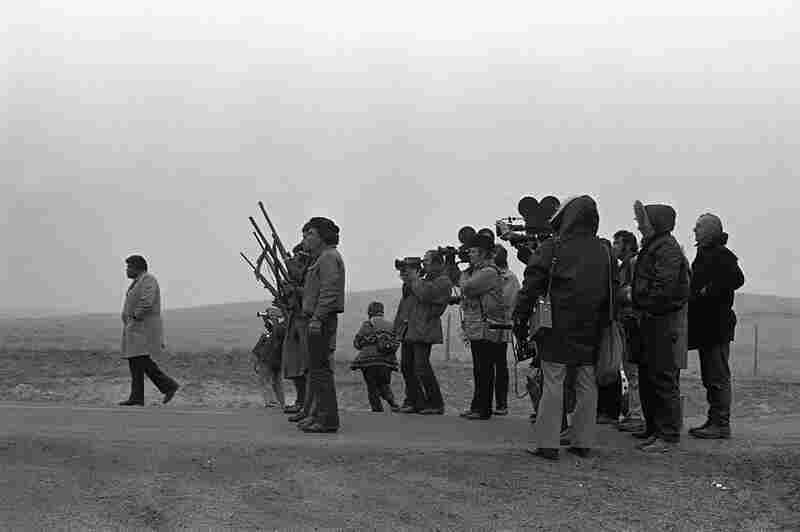 A Photographer Remembers Wounded Knee, 40 Years Later : The Picture Show A photographer looks back on some of his first work, documenting the 1973 standoff on South Dakota's Pine Ridge Reservation. 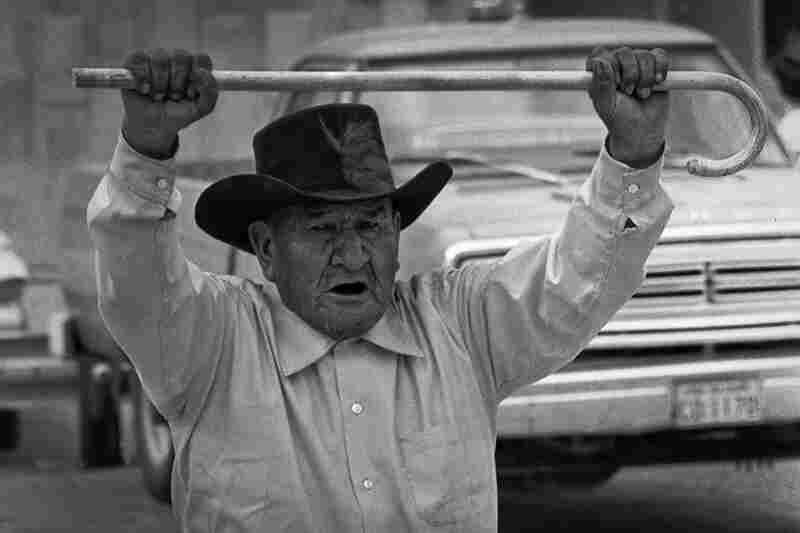 Vietnam veteran, Sid Mills, a Yakima man, stands guard. 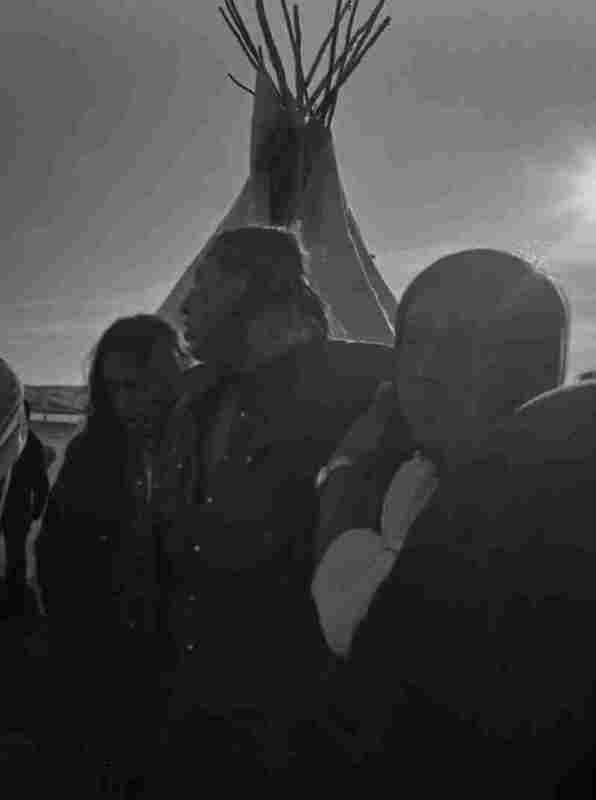 Lakota Elder Tom Bad Cob sings a Lakota lament. This would be the last time I would see him, as pressure from law enforcement prevented me from returning to Pine Ridge for many years. The FBI blocks the road. 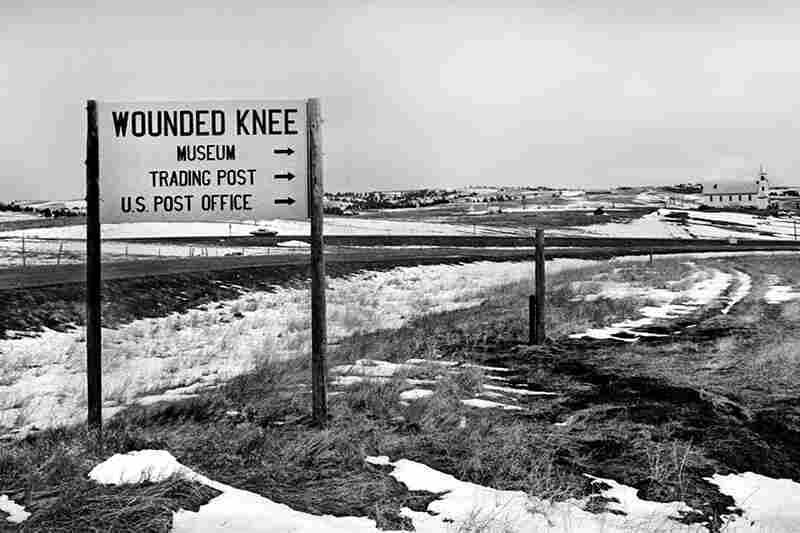 Entering the hamlet of Wounded Knee. 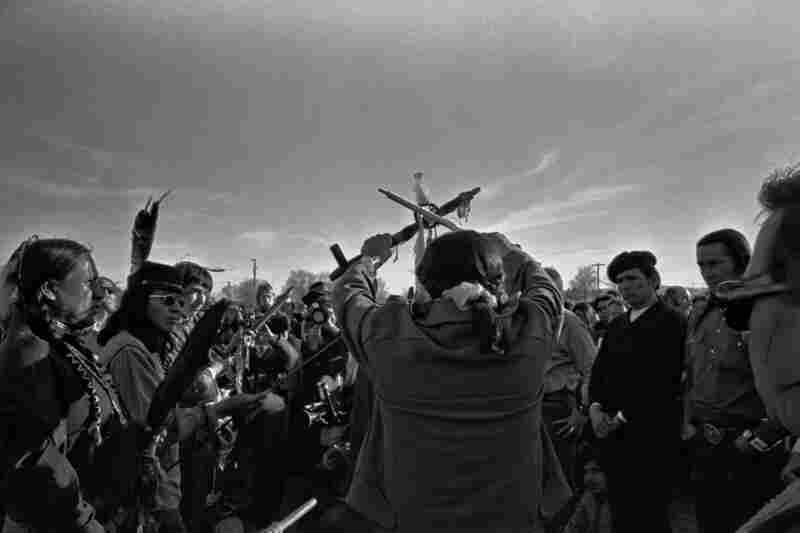 Leonard Crow Dog, spiritual leader of the American Indian Movement, prepares a chanupa (pipe) for prayers. 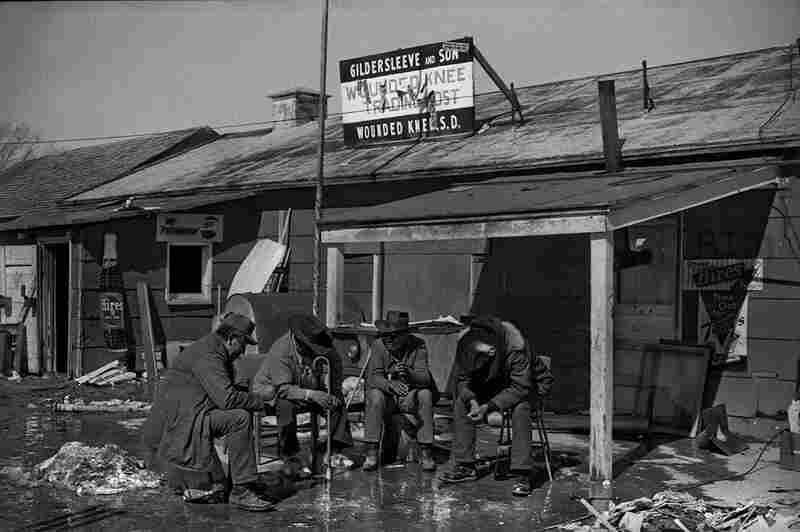 Lakota elders gather in quiet discussion of the events. 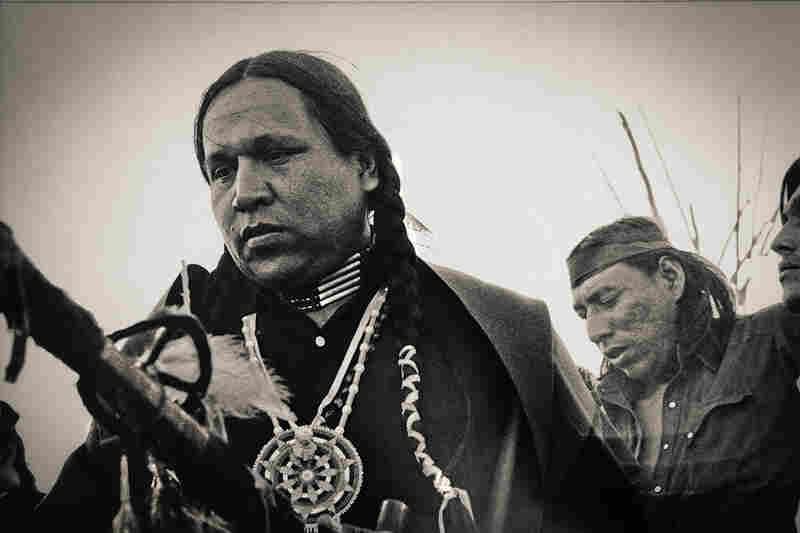 Frank Fools Crow offers two chanupa to the four directions, seeking guidance. 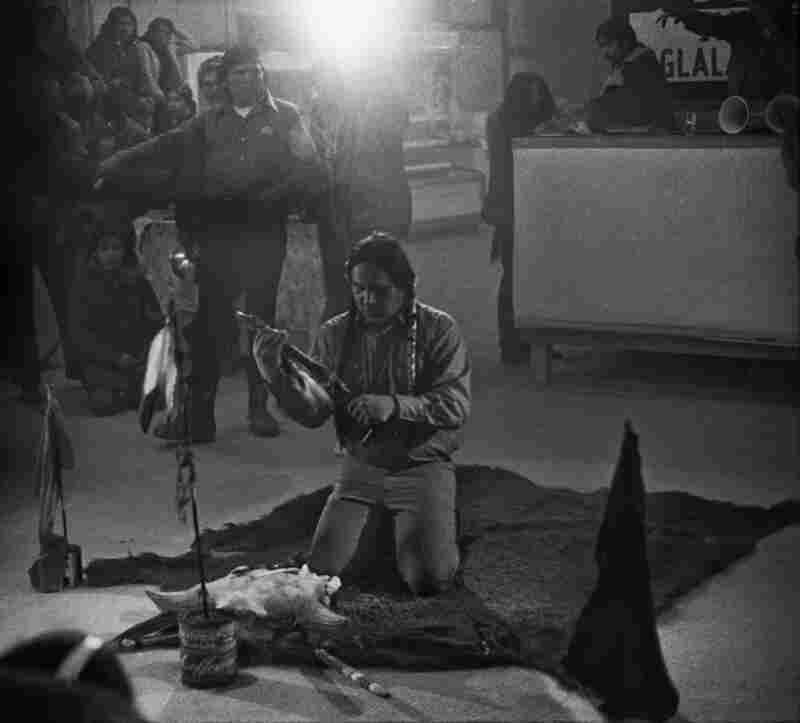 Crow Dog leads prayers and blessing for two warriors who had been wounded when they were shot in the legs. 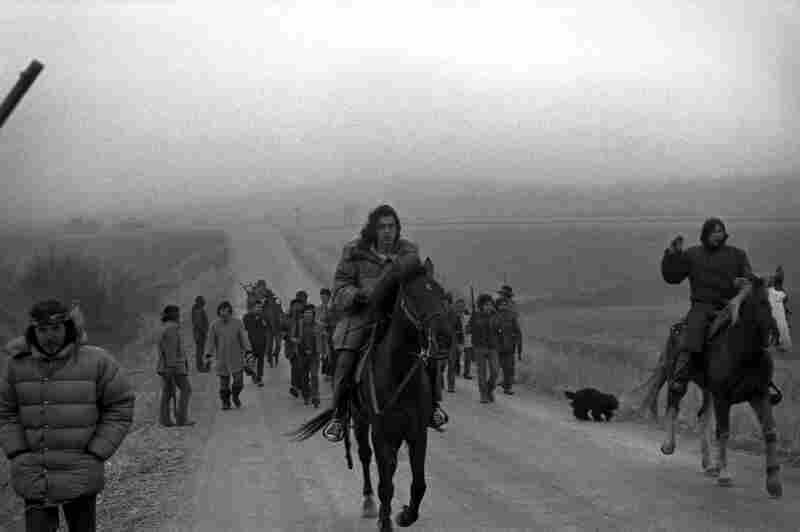 The drum leads the people to the mass grave of those who were killed in the 1890 massacre at Wounded Knee. "Checkpoint Charlie" has obviously seen its fair share of action. Harlington Wood Jr., assistant attorney general for the U.S. Department of Justice, holds a press conference. Shortly after his arrival,Woods became too ill to continue negotiations that were aimed at a peaceful conclusion. Woods was replaced by Kent Frizzell. The electricity was cut, and all food and medical supplies were blocked from entering the area. 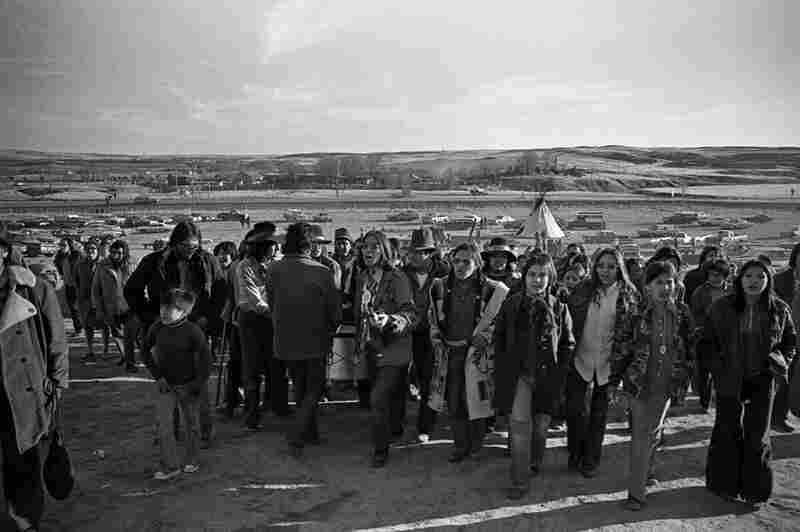 The funeral for Frank Clearwater, one of the two Native Americans who died in the conflict. Mounted escorts lead Harlington Wood Jr., assistant attorney general for the U.S. Department of Justice. 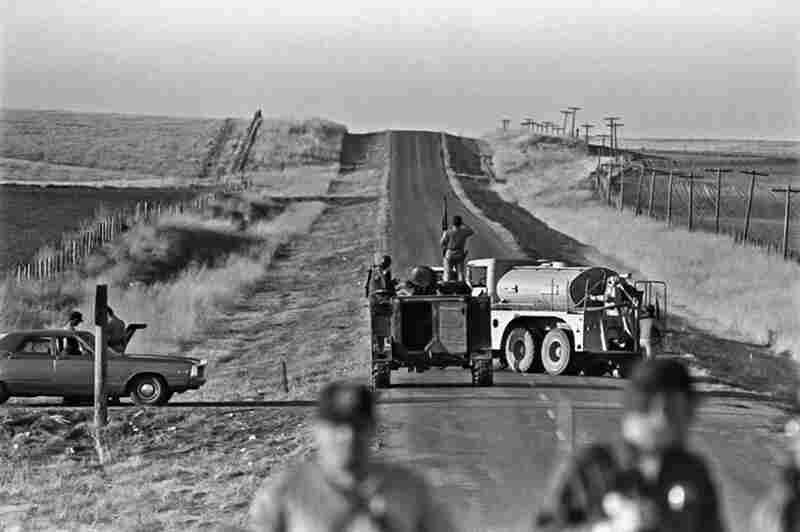 Forty years ago, a caravan of more than 50 cars full of demonstrators pulled into Pine Ridge Reservation in South Dakota. 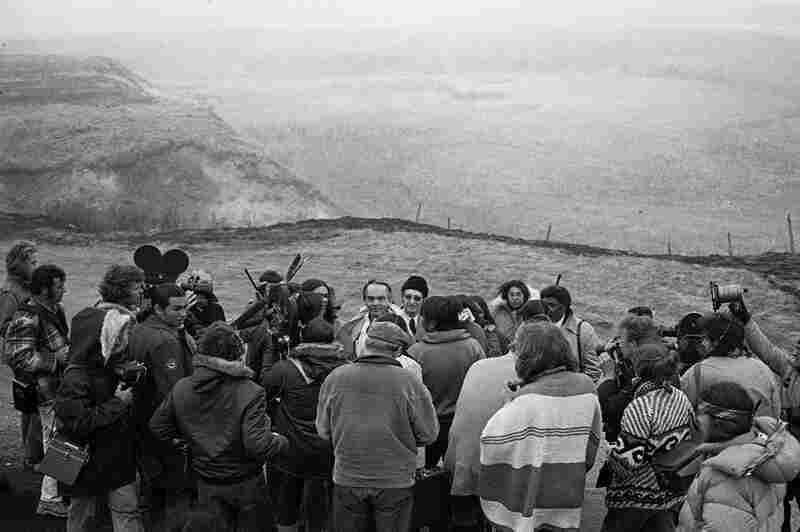 That day marked the beginning of a 71-day occupation led by members of the Oglala Lakota tribe and followers of the American Indian Movement, attempting to address long-standing grievances — not only with the U.S. government but also with tribal leaders. 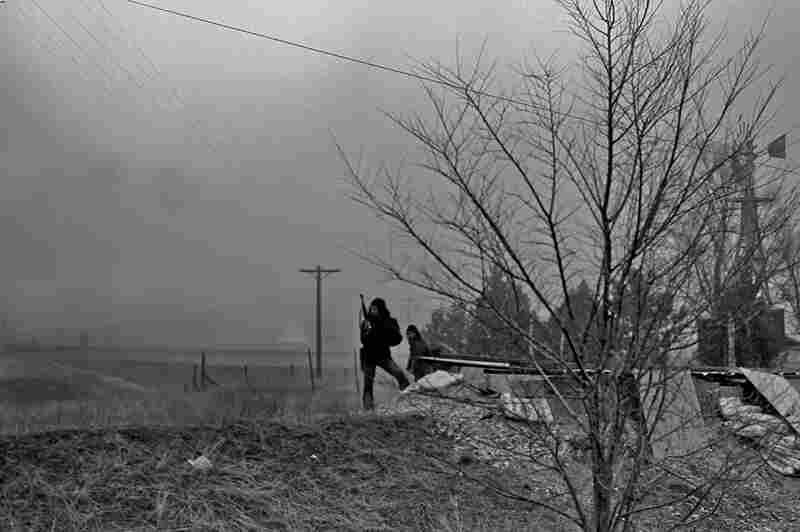 Over those 71 days, Pine Ridge was effectively barricaded from the outside world. Electricity was turned off even though it was winter, and food and medical supplies were halted. Two Native Americans died before the standoff ended. A young Owen Luck got there on the fourth day. He had been a medic in the Vietnam War and was a fledgling photojournalist. "I had very little experience, and this would be considered my first shoot," he says. 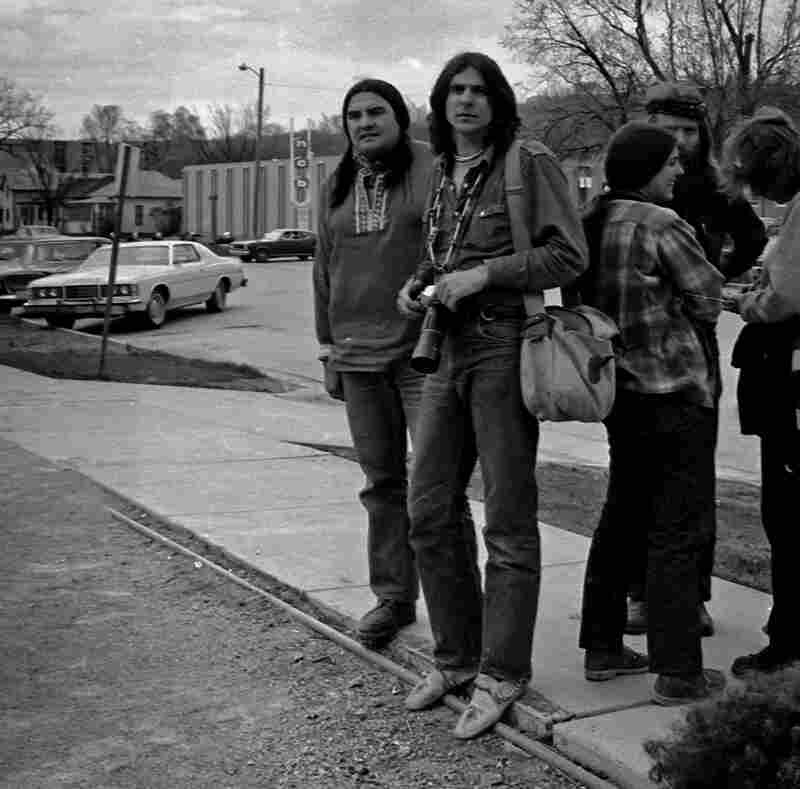 Forty years later, we chatted on the phone about the photos he took at Pine Ridge while serving as a medic and what he sees in them today. "I see people who have passed away. ... We were all so young. There's a photograph of me — and I was this skinny young guy. I'm hardly that person anymore. I see the volunteers that showed up. ... 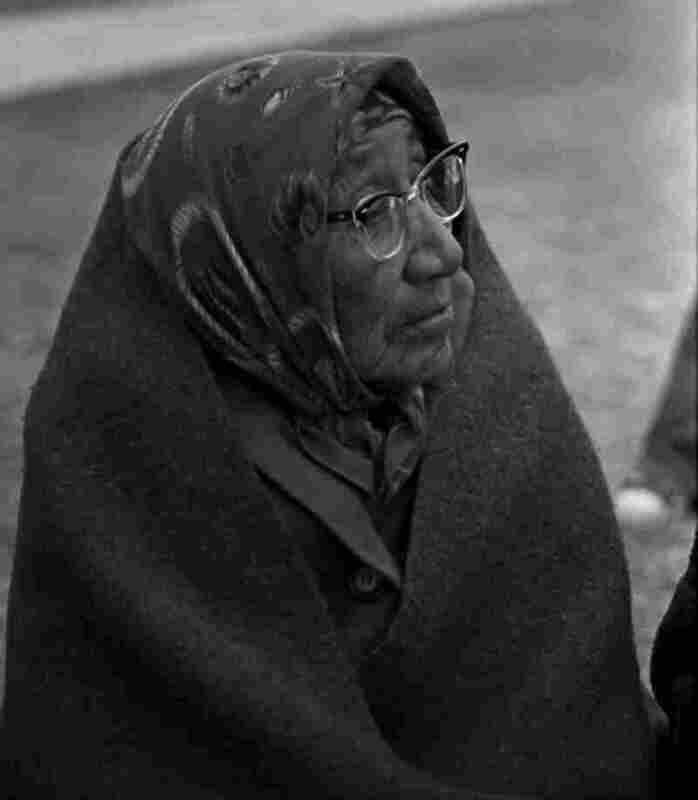 I remember being hungry and being cold. I remember being shot at. The camaraderie. I guess when I look, I feel very honored that I was allowed to participate." That's the thing with Luck: He doesn't consider himself an objective observer. "I realize as I look back that I only photograph things that I want to participate in," he says. 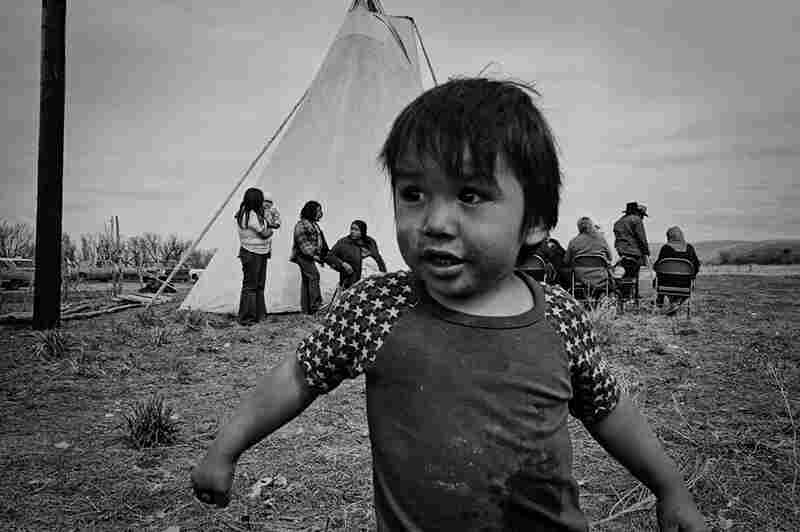 "I wanted to learn through a lens that the communities would hold up for me to observe." 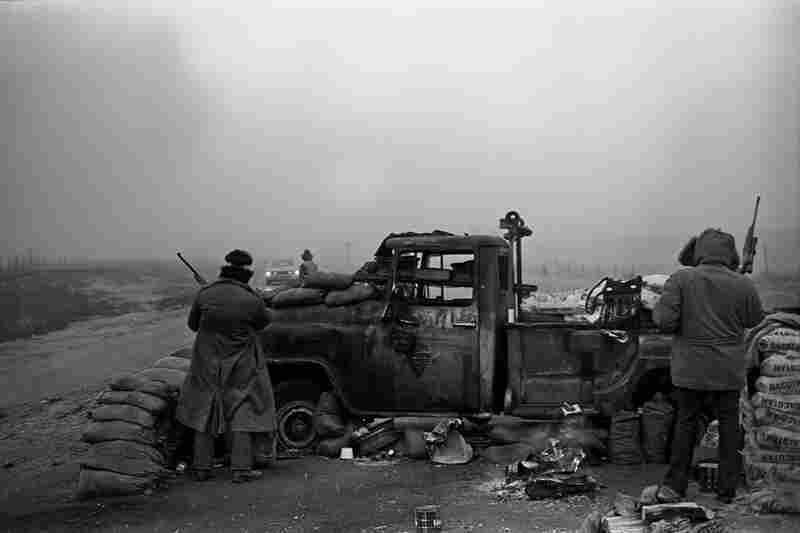 Although he was one of countless photographers documenting the siege, his account is personal and intimate. Over the years, Luck has continued to focus on Native American issues, and has spent the past decade with tribes in the Pacific Northwest. 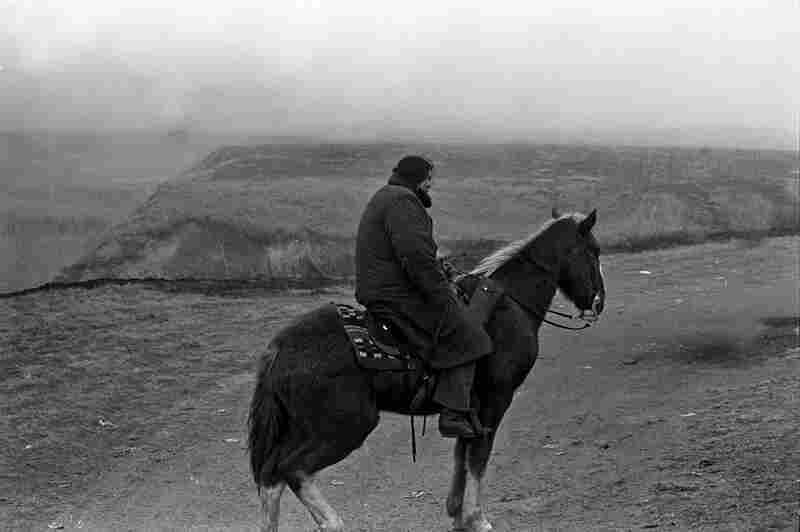 As for the 1973 Wounded Knee protests, he says he hasn't discussed it with outsiders in years. "I stopped talking about this with nonnatives the same way I stopped talking about Vietnam with nonveterans. Trying to explain being there, to me, is like a woman trying to explain labor to a man," he says. It may be impossible to understand the nuances unless you were there. But Luck's photos take us one step closer. A previous version of this article stated that an FBI agent died before the standoff ended.